Maxing your construction efficiency across multiple areas can have a very positive effect on the bottom line of your business, as well as the health and happiness of your employees. Proper efficiency is usually a commonly overlooked factor of the building and construction process. By taking time to implement more productive practices you’ll be well on your way towards a more profitable and effective company. Managing energy is a core component of the efficiency process, as well as consistently looking for ways to maximize revenue. By running an efficient job site and incorporating efficient building practices, you and your company will be able to cut costs and realize massive savings. Energy efficiency is becoming increasingly important throughout the construction industry. A big part of this shift is being directed by client needs, as they are seeking buildings that are more sustainable and will last longer. Often, energy efficient building solutions can end up being more cost effective in the longterm. Energy efficient building is challenging the way things have been done in the construction industry for a long time. This means that companies who adapt quickly will be at the head of the curve, while those who fail to adapt will slowly begin to see their grasp on the marketplace begin to dwindle. Because energy efficient building is so new, there are a lot of new avenues being explored and developed every single day. One of the biggest discrepancies that energy efficient building companies have to overcome are the initial up front costs. When people hear energy efficiency they automatically assume that it’s going to be a cheaper and better investment. However, the shift in up front costs to long term savings needs to emphasized. Efficient buildings will end up saving the client money over the lifetime of the project, but this usually comes with a steeper up front cost. Certain projects will pay back faster than others either due to lower up front cost, or a higher ability to save the owner money. This needs to be be focal point of any efficient building proposal. Energy efficient buildings have grown to be more technical in nature, yet still remain energy efficient. This is due to the constant refinement of energy technologies that either allow the storage, creation or more capable use of energy to be integrated into the building process. Efficient buildings also have to be more precise in the engineering and building process, as energy flow of a building is very important. Energy efficient buildings are usually much easier to maintain over the long run. Usually, this is due to the use of higher-quality materials and a more detail-oriented building process. Different certification systems, including LEED and Energy Star certifications, help to ensure the quality of materials remains high over the long-term. 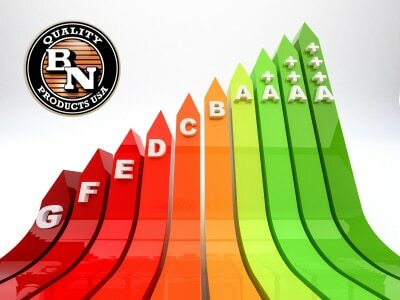 These third-party parameters help to make sure that a high standard of energy efficiency remains constant. Efficient construction can also help to protect you from fluctuating energy costs. However, it’s important that your building addresses the three central elements to a completely efficient system. The best energy sources are not from fossil fuels, but instead from sources that are essentially infinite, such as the sun, wind and ground. It’s important that you seek to unlock the power of renewable energy throughout your construction project. Whether you’re utilizing solar power, ground-source or biomass, there are plenty of options available at your disposal. You can even create unique combinations of renewable systems to ensure your energy producing capabilities are exercising their potential. Imagine living in a home that uses very little energy. Most older homes are extremely energy intensive and require a massive monetary investment just to keep the home heated, cooled and everything running. By utilizing energy efficient solutions to heat and cool buildings you can greatly reduce your energy costs. For instance, there are surface systems available for heating and cooling walls, and systems developed for underfloor heating and even intelligent control systems in order to ensure optimal heating and cooling performance. Reducing energy loss is a very important aspect of efficient building. Imagine having to consistently run your heater, because you’ve left your front door completely open. Energy loss occurs through windows, surfaces and other intentional elements that allow the building to breathe. However, it’s very important to minimize energy loss points through your building to ensure the optimal rate of energy flow remains constant. Materials such as windows, doors, composite curtain walling, and finishes will go a long way towards reducing energy loss throughout the building. Beyond just helping out the environment and creating a healthy work or living environment, energy efficient construction and buildings also have a slew of other benefits for both the construction industry and its customers. Certain tax breaks exist which help to offset the initial costs of the efficient building process. On the state, local and even federal levels there are energy efficient grants that exist, which can greatly bring down the overall cost of a construction project. It’s helpful to explore every option you have at your disposal, as a lot of these energy efficiency grants go unused every single year. Energy efficiency should start to become a focal point of your building process if you want to remain relevant and thrive into the future as the construction industry continues to evolve.